Mike Elosh began performing as a solo acoustic artist in 1997. 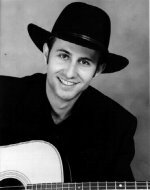 His self-titled CD recording debut earned him the respect of his peers, and in 1998 he was nominated by members of the Washington Area Music Association as the Best Male Vocalist in the Traditional Folk category. He learned to play music by listening to old time and country music greats such as Mississippi John Hurt, The Carter Family, and Hank Williams. Mike Elosh is most often compared to Leonard Cohen, Bob Dylan or John Prine. Like most artists, he feels uncomfortable with comparisons but says, "If people want to put me in that good company, I really can't complain." Mike Elosh's 1999 release BLACK INK marks the next step in the development of this accomplished songwriter and performing artist as he broadens his full time touring schedule to include regions beyond the Washington, Virginia, and Maryland areas.